One of the biggest changes in software over the years is the ability to share data between platforms. Polygons, lines, and points that are drawn in ‘real space’ (latitude, longitude, and altitude) can be easily transferred between Global Positioning System (GPS), Geographic Information Systems (GIS), and Computer Aided Drafting (CAD ). Many of these files, or derivatives of, can be shared with rendering programs as well. Along with this ability to share between platforms, is the rapidly increasing accuracy of this data. Current GPS, GIS and Real Time Kinematic (RTK) measures can have accuracies that make subtle topography easier and more accurate to read and construct. RTK and GPS integration and communication with CAD make for highly accurate existing conditions information, construction precision, and as-built documentation. Part I summarizes our presentation in Denver, including technology used for Site Analysis and Design Development within restoration design. In Part II, we will summarize technology used for visualization, construction documentation, and construction. • GPS Cameras produce photos that are easily uploaded to Google Earth or GIS software placing them where they were taken for quick location specific reference, as well as helping others who have not been to the site understand conditions easily. • Tablets and smartphones make for great site analysis and documentation. Not only can you take georeferenced photos, but you can also mark elements on mapping apps and use photos and various sketch software to document or highlight elements that may not be totally obvious in a quick photo glance. • Open source data (as well as proprietary) is increasingly available online for use. This includes historical imagery, topography, soils, mapped flood zones, and more. This data is not just available in image form, but also in data that can be imported into GIS and CAD for interpretation and manipulation. The biggest caution in using these files is making sure that they are a resolution that is helpful and that you use the correct datum (the global/local special reference and scale used); especially the vertical. 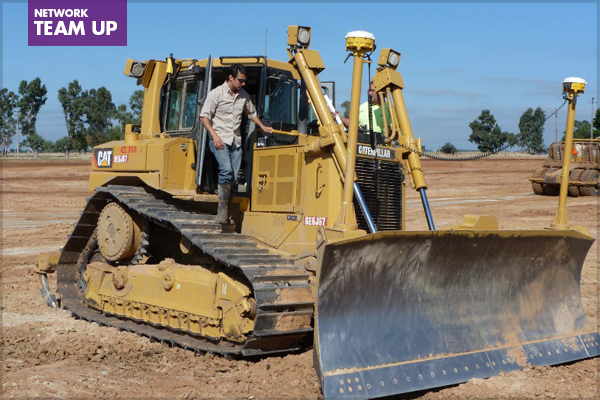 • RTK and GPS data can be collected in the field to help better understand the existing conditions and create base files for concept and design development. RTK based topographic and bathymetric surveys, along with point clouds from LiDAR and other sources can be used to create highly accurate 3D existing surface/grade models to be used in GIS or CAD platforms for project development. • Rasterizing scanned sketches can be a quick and easy tool for both site analysis and design development. Rendered concept plans can easily be scanned and manipulated in Photoshop or other imaging software to allow overlaying on aerials and existing condition data. Designing subtle and organic shapes and orientations can sometimes be difficult to draw on the computer (for some of us). Scanning the sketched lines and rasterizing them either in Photoshop or AutoCAD can be a quick and easy way to translate hand-sketched lines into polylines or shapefiles for further development in a variety of programs. Likewise, hand tracing printed aerial images is sometimes easier than digital tracing, making scanning and rasterizing a quick way to digitize existing elements and conditions on a site. • Developing 3D landforms in Civil Series AutoCAD (and other programs) can be done in a variety of ways. While one can draw contours and lines in the traditional drafting sense, one can also automate some of the process. Channels, slopes, and other site grading can be developed in a variety of ways: developing grade breaklines and specifying slope percentages or ratios can auto generate slopes tied into existing grades; channel alignments and slope specifics can generate the full configuration of the channel; or, you can even use the road generation tools in inverse to create channel alignments and intersections. The options are almost endless on the level of drafted versus generated forms for grading. 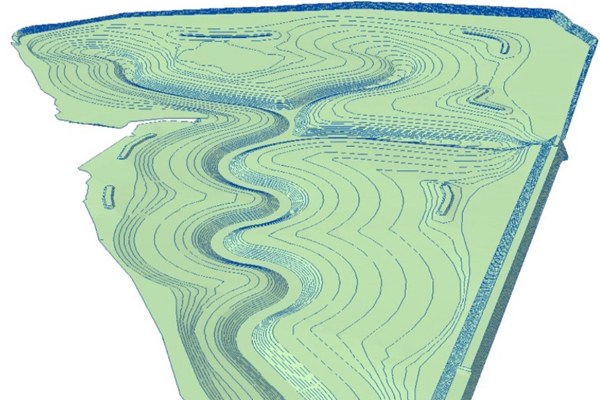 • Developing 3D landforms using ArcScene is similar to CAD in that you can draw traditional contours and spot elevations to represent the proposed landform. 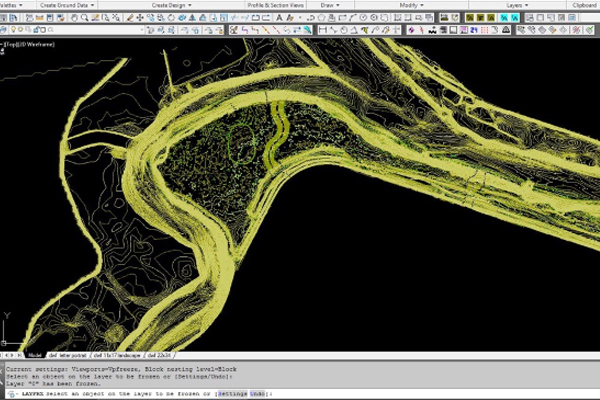 Though not as potentially automated as the Civil Series tools, 2d breaklines and 3d sloping lines can be created and combined to form complex topography. • Calculating acreages and volumes has become not only important to manage costs for construction, but to also understand and model existing conditions and potential changes in hydrology. Calculating soil volumes and project acreages for an entire site or even small areas have now become relatively easy in both GIS and CAD platforms. The ability to share data between programs has led to easy development of advanced and predictive models for dynamic site hydrology. • Phased implementation approaches are often considered early in the design and planning process and have been easily analyzed in both GIS and CAD software for some time. With the continued evolution of CAD and GIS software, assessing potential project phasing much later in the design process (often caused by a new constraint being discovered) can be accomplished by leveraging either built in tools or customizing and developing your own with scripts. Being able to iterate through a series of potential decisions, analyze and compare data between them, and present the information visually back to the project team – all within days or weeks, instead of weeks or months, can significantly benefit both project schedules and budgets. • Field Verification can be critical to ensuring the construction drawings make sense. Data related to existing and proposed elements can be exported to GPS or even Google Earth on a tablet or phone to field check locations, help stakeholders understand the design, complete preliminary stakeout, and work on design adjustments. Data can also be exported to RTK gear to better understand proposed depth of cuts and fills on the site. by Allegra Bukojemsky, PLA, ASLA, LEED AP, with Wildlands; Mark Carpenter, ASLA, GISP, with KTU+A Planning and Landscape Architecture; David Leonard, ASLA, AICP, GISP, LEED GA, with Parsons PGS—a collaborative effort between the Digital Technology PPN and Ecology and Restoration PPN. Part II of this post was published on July 28, 2015.